Jeffers continues her series of interpretations of traditional holiday stories and songs (The Twelve Days of Christmas, 2013, etc.) with this large-format version of the beloved holiday song. 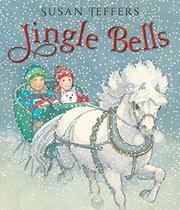 An intriguing cover invites readers along for a “ride in a one-horse open sleigh” drawn by a beautiful, white horse dashing through flurries of snow. In the sleigh are the main characters of the visual story Jeffers has created to support the song’s lyrics, a white brother and sister and their little white terrier. They are carrying a Christmas package for Grandma, and their journey to deliver her gift across snow-covered fields is filled with adventure. The sleigh overturns, and the dog runs after a rabbit, getting lost in the snow and then encountering a fox, swans, otters, and raccoons. The children must go on without their pet, but when they arrive at Grandma’s house, they see reindeer and another sleigh in the yard. Inside, Santa is having tea with Grandma, with the missing dog on his lap. Jeffers excels at snowy scenes, with masterful compositions integrating terrier and wild animals as the children call for their pet, always just missing a connection. The words to the song can be sung at tempo with the story unfolding quickly, or the text can be read slowly as a poem, with the details of the lovely art savored at a leisurely pace.